Despite the misgivings about Status Quo going acoustic, the consensus seems to be it was a direction that worked, judging by the fact the 'Aquostic' album has been their best selling work since 'Don't Stop' all the way back in the 1996. This DVD/CD set features the band showcasing the re-worked material live on stage, as televised by the BBC. 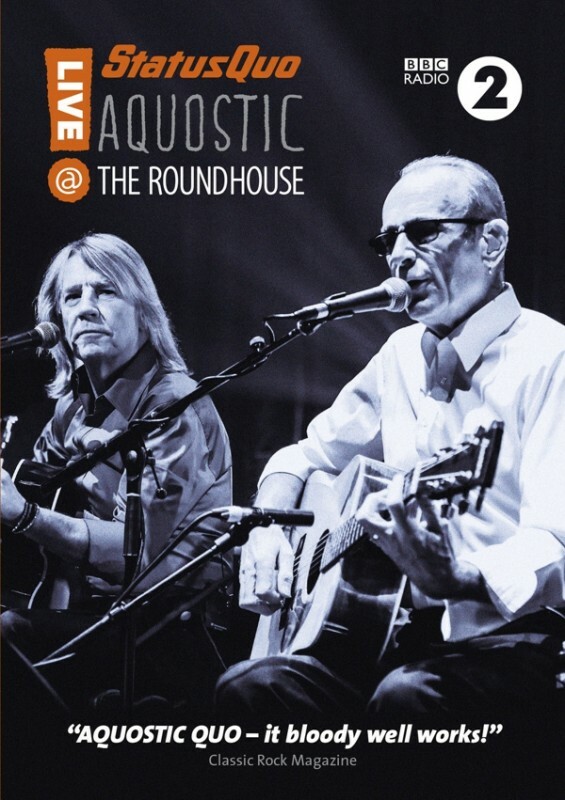 They're often bashed for only knowing three chords and all that nonsense, which Quo take with their usual good humour, but it's only when you watch them recreate these songs acoustically that you realize there is a reason why they have been around for four decades. They write really good, catchy songs that you can't help but tap your feet too and they have the musicianship to put them in what should be a completely alien format, and it results in something quite brilliant. This performance sees the band perform everything from the 'Aquostic' album, bringing with them all the added ingredients such as the female backing singers, strings, percussion... the works. What adds to it is the audience clapping and singing along, completely embracing this new sound. As I reviewed 'Aquostic' previously, I don't need to say too much about the song arrangements themselves, but it's worth reminding everyone just how well tracks like 'Paper Plane', 'Whatever You Want' and 'Mystery Song' work in this unplugged style. Watching this, with the great lighting and enthusiastic crowd, only adds to what is already a great experience. Available on DVD with an audio disc version, this is the perfect partner to the 'Aquostic' album. Thoroughly enjoyable!